Photo of Gerald Casel by Robbie Sweeney. Courtesy of Gerald Casel. My choreographic work complicates and provokes questions surrounding colonialism, cultural amnesia, whiteness and privilege, and the tensions between the invisible/perceived/obvious structures of power. For this residency, I will be engaging with artists as co-interrogators to look closely at the role race plays in dance production and presentation. We will ask how our work as artists functions in society and how the communities we engage with are considered, internalized, and reflected through our work. Employing a 'systems thinking' approach, I hope to connect with sectors of the Bay Area dance ecology and beyond to engage in invigorated dialogue to better understand how all are interconnected. We will invite curators, critics, scholars, dance writers, grantors, collaborators, publicists, and audience members to come together to spark conversations around dance. We will address systems of support, power and privilege, race and colorblind racial ideology, issues and problems around diversity, resilience and sustainability, and more. Working with the premise that all sectors are interdependent, we will promote a culture of empathy so that every part of the dance community feels more visible, heard, and understood. Finally, we will identify issues that dancers, choreographers and their collaborators face and will try to create solutions to problems that may be attributed to misunderstandings, uninformed assumptions, and myths. A discussion about how institutional thinking and models can advance equity in the field. A Long Table conversation--as first conceived by theater artist Lois Weaver--is initiated by an invited core group of participants who "set the table" with food for thought, but it is open, throughout, to other folks, sitting around the perimeter, who can come up and take seats at the table to share their experiences, ideas, questions and insights in a non-hierarchical, non-panel/Q&A setting. They are not so much "audience members" as a listening and contributing community. In this spirit, guests to the gathering are invited to bring a snack or food item to share. Article about the project by Sima Belmar for In Dance. Blog post about the project by Bhumi Patel. 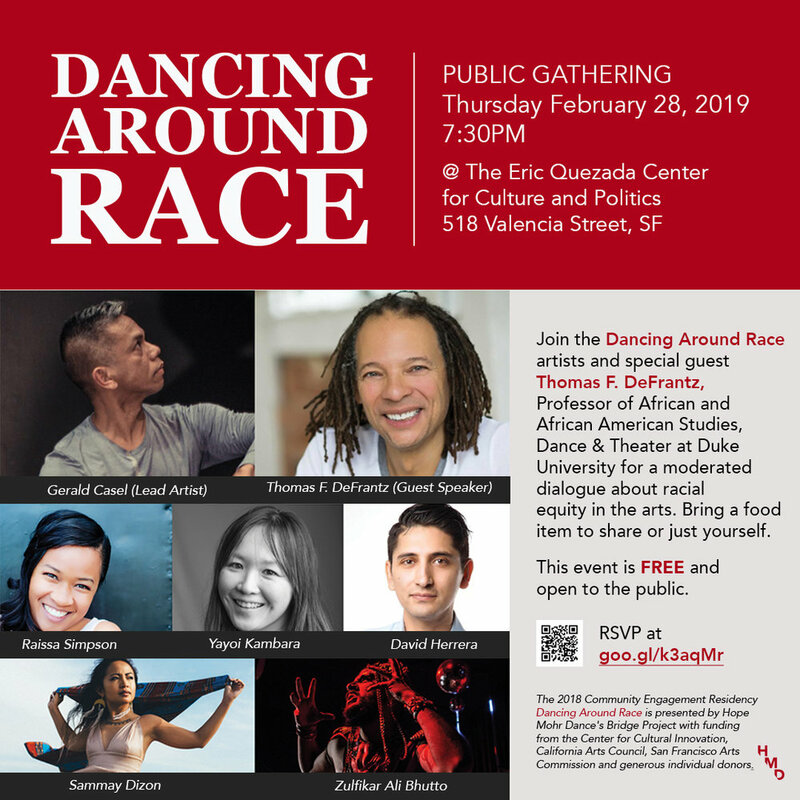 Funding for the Dancing Around Race came from the San Francisco Arts Commission, the Center for Cultural Innovation's Investing in Tomorrow program, and the California Arts Council, a state agency. Learn more at www.arts.ca.gov.